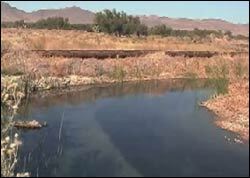 Ash Meadows Wildlife Refuge A popular location for photographers and city folks alike, Ash Meadows Wildlife Refuge features unique plants, endangered pupfish, nature trails and picnic areas just outside Pahrump. Visitors can check out migrating birds in the fall and take a dip in the Crystal Reservoir during warmer months. 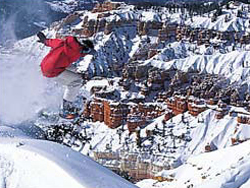 Brian Head Resort It's just three and a half hours from Vegas, but you'll feel a million miles away. The abundant greenery, lava flow formations and numerous lakes bring you into an entirely different world. 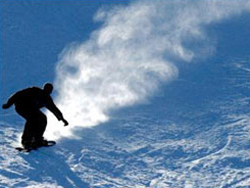 Ski in winter without worrying about long lift lines. 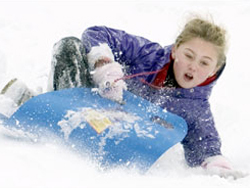 For a cool, crisp escape from the city, Brian Head Resort offers ultimate seclusion. 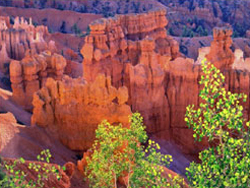 Bryce Canyon The gorgeous Bryce Canyon National Park offers amazing views of vibrantly-colored rock formations as well as a diversity of trees, flowers and wild animals. 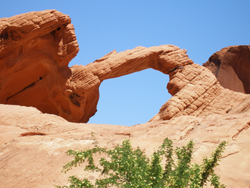 Located in Utah, approximately 270 miles northeast of Las Vegas, visitors can enjoy 50 miles of hiking trails for all fitness levels. Cedar Breaks National Monument Located in between Zion National Park and Bryce Canyon National Park, Cedar Breaks sits at an altitude of 10,000 feet. Marvel in the beautiful red sandstone cliffs and catch views of wildflowers, green meadows, lakes and an abundance of trees. If you're looking for a change of scenery, then this place is for you. 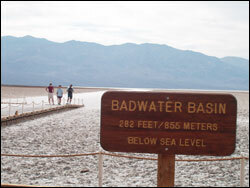 Death Valley National Park Death Valley is known for more than just heat. It also features the Racetrack dry lake bed with famous rolling stones -- after rain, winds blow the stones hard enough to fall off the cliff. The Ubehebe Crater (once a hangout for infamous killer Charles Manson) measures an astounding 800 feet deep and a half-mile long. 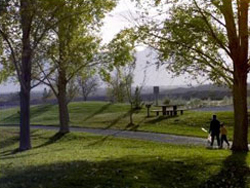 Floyd Lamb State Park Escape the city hype and sit amongst ponds, scenic paths and picnic areas at the historic Floyd Lamb State Park, located in northwest Las Vegas. Get up close and personal with peacocks, duck and geese. Visitors can plan a fishing trip here as well. Grand Canyon Located 300 miles southeast of Las Vegas, the world-famous Grand Canyon offers breathtaking views of its towering, colorful cliffs and the ultimate escape from the city life. 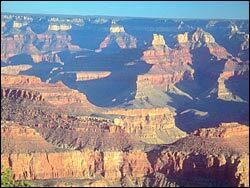 This well-known landmark measures one mile deep and almost 280 miles long. 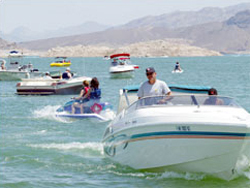 Lake Mead Considered the largest man-made lake in the United States, Lake Mead is a short drive from Las Vegas. Visitors can swim, jet ski, sunbathe and relax at this attraction. Hoover Dam is also right next door. Mount Charleston Popular for its crisp, fresh breezes and various hiking trails, Mount Charleston is a short trip from the Strip. Part of the Spring Mountain Range, Mount Charleston rises as high as 12,000 feet in elevation. Wildflowers, waterfalls and a variety of trees can be seen here. Cabins and campsites are available. Red Rock Canyon Located only 15 miles west of Las Vegas, Red Rock Canyon offers a quiet, secluded escape filled with greenery, unique plants, petroglyphs, wild animals and much more. 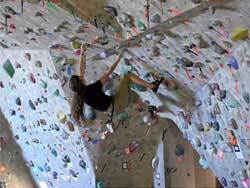 Red Rock Climbing Center Located only 15 miles west of Las Vegas, Red Rock Canyon offers a quiet, secluded escape filled with greenery, unique plants, petroglyphs, wild animals and much more. SoBe Ice Arena Hockey fans, rejoice! 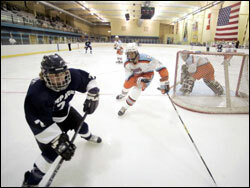 The 31,000-square-foot Sobe Ice Arena houses up to 500 people during hockey games and events. Free ice skating is available, but be prepared for a full house. Skate rentals are available. 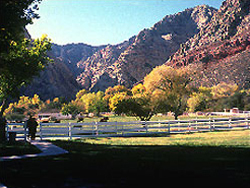 Spring Mountain Ranch Inside Red Rock Canyon, the 520-acre Spring Mountain Ranch is a perfect place for a picnic. The sprawling green pastures, quietness and fresh air make for a pleasant and relaxing lunch. Inside the ranch house, tour guides walk visitors through and share remarkable history of former residents including Howard Hughes. Valley of Fire Don't forget your camera! 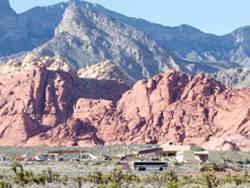 Valley of Fire offers radiant views of its fiery red sandstone rock formations. 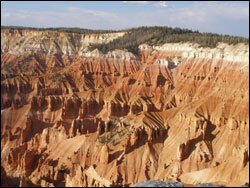 Visitors can climb and explore the 35,000-acre park and capture close-up views of this spectacular wonder. Valley of Fire is located about 50 miles north of Las Vegas. 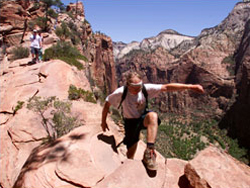 Zion National Park For a one-of-a-kind scenic experience, visit Utah's Zion National Park, located two and a half hours away from Las Vegas. Here, you'll have the opportunity to see canyon walls as high as 3,000 feet as well as the 6,555-foot-high Watchman at the south entrance of the park. Zion National Park is home to nearly 800 native species (Mexican spotted owls, Zion snails and peregrine falcons, to name a few), wildflowers in the warmer months and rich, colorful autumn foliage.